I’m not sure there has ever been a more apt name for a film than the one musician turned filmmaker Quentin Dupieux chose for his newest existentialist romp through suburbia—Wrong. Everything about this movie is just that—wrong. From the transposing of inside and out to the metaphysical impossibilities of objects changing shape and identity to the completely absurd juxtapositions of life and death or present, past, and future, nothing that occurs to the unassuming Dolph Springer (Jack Plotnick) can be explained. Whether he has lost his mind due to the disappearance of his dog Paul or not, everyone else in his life appears unfazed by the surrealistic happenings around them too. A visual puzzle that could be the offspring of David Lynch and Richard Kelly‘s minds, Dupieux has created something uniquely his own. The question than becomes not whether there is some over-arching narrative or metaphorical “a-ha” moment of clarity hidden beneath the superfluous nonsense, but instead whether you’re willing to take the ride without caring if there is. If Dupieux was here right now explaining to me his motivations and didn’t say something to the tune of, “I just wanted to jam as much off-the-wall insanity as I could inside a world too easily molded into a conformist’s idea of normalcy,” I’d laugh in his face and label him a pretentious blowhard too involved in the sham of artistic meaning to admit when he’s having fun. Each viewer will read into the events onscreen with their own personal histories and memories of lost pets or crazy spouses or whatever—they will make Wrong their own. That’s good enough for me. The film is an escapist’s wonderland of life turned on its head so that up literally becomes down. Here are a bunch of common exchanges we’ve all seen or been involved with inside the confines of normal society, yet none go where we’ve been conditioned to expect. Dupieux takes the regular concept of a man losing his job and not only flips it to the point where the victim decides to still show up at the office and pretend to work without pay, but he also throws in a downpour of rain soaking everyone and everything engaged in the company’s day-to-day. Drenched in water, Dolph’s co-workers lick soggy envelopes, file limp papers, and tap away at computer keyboards that in the real world would have shorted out long ago. Dupieux’s world isn’t just askew; it is turned inside out. Emotions and psychological ticks have manifested themselves to the surface so the daily grind of deskwork literally drowns you, a cop’s power trip allows him to speak his mind and refuse to give details on a tragic accident because frankly it’s none of anyone else’s business (Mark Burnham), and people lost inside the lives they’ve imprisoned themselves within attempt to escape only to end up driving into the nothingness they have resigned themselves to constantly be drawn towards (Regan Burns). Anything our minds desire is possible on an Earth without rules. If we want to talk to our dogs through telepathy or exchange messages through a series of random strangers’ minds, we can. Who’s to stop us from discovering the unknown through crackpot science and blind faith? Maybe the world would be a better place with an enigmatic soul like Master Chang (William Fichtner) playing puppet-master with ease. Do I agree with his technique of kidnapping pets so their owners can learn to love them as new when returned due to their prolonged absence? Actually, maybe I do. No, sorry, that’s just my love of eccentric comedy showing through. The reality is that I enjoy characters able to delve into others’ subconscious to manipulate them into doing and feeling without ever being aware a third party was present. Master Chang is for all intents and purposes a ghost; a deity lording from on high, watching from his limousine window without any need to interact with the pieces he’s moving around the chessboard. Now, if Dolph was the kind of guy easily brainwashed into believing whatever drivel came his way, Wrong would be a completely different and less effective film. The fact he is perpetually rolling his eyes at the idiocy of others, quick to throw Master Chang’s book My Life, My Dog, My Strength away due to its absurdity, and constantly questioning the weird occurrences happening without sufficient explanation allows us to enjoy the zaniness more. Being just as skeptical as Dolph, his eventual belief in telepathy and ease at accepting the re-appearance of his gardener Victor (Eric Judor) after apparently dying forces us to question whether everything we’re watching is a construct of one man’s mind or simply the world Dupieux has intentionally manufactured as some sort of alternate dimension. It gets easier to believe this odd town is light years removed from our own once Zia Harris‘ painter pops up with pro bono car makeovers, Alexis Dziena‘s promiscuous pizza parlor cashier hangs a wedding photo of her and her ex-husband in the house of her new boyfriend, and Steve Little‘s ‘high-level’ Detective Ronnie taps into the memories of a dog dropping inside his office at the back of a pharmacy. These things simply don’t happen in real life. Palm trees don’t transform into pines, joggers don’t get embarrassed enough to lie about their exercise regiment right after their target sees them running, and it doesn’t rain indoors. Dolph’s life is only strange because we live in a universe where certain laws of physics are set in stone. That said, wrong has never been so right. Oh, and one more thing. 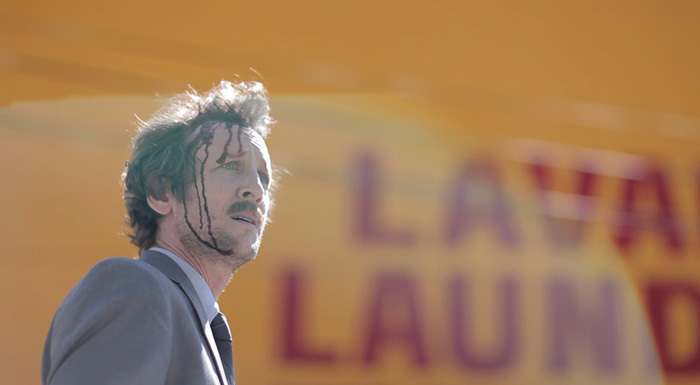 Don’t forget to stay until the credits finish for one last glimpse of Fichtner’s hysterical guru. 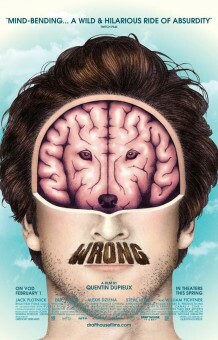 Wrong is now on VOD and opens in select cities on Friday, March 29th. Check out more info on the official site.